Why bin perfectly good food when you can donate it? One GrabFood deliveryman did exactly that, warming the tummy of a 76-year-old man, along with the hearts of many. 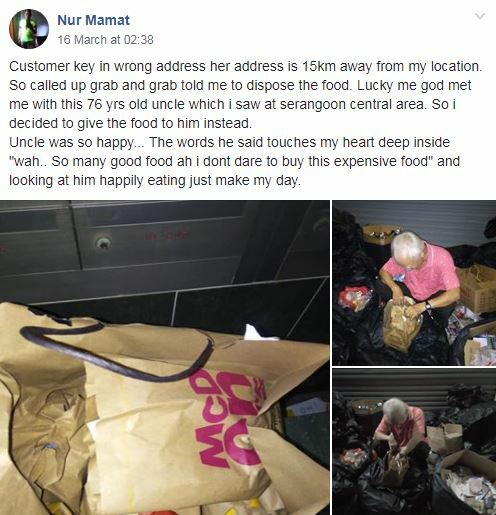 Posting to the GrabFood Delivery Rider Singapore Facebook group in the wee hours of Saturday (March 16), Nur Mamat described the series of events after he was left with a bag of food from a wrong order. "Customer keyed in (the) wrong address, her address is 15km away from my location. So (I) called up Grab and Grab told me to dispose (of) the food." Instead of throwing it away however, he chanced upon an elderly man at Serangoon Central and decided to give the food to him instead. In photos posted along with the caption, the uncle, wearing a pink collared T-shirt is shown squatting among trashbags and cardboard boxes, digging into a large McDonald's paper bag. According to Mamat, the elderly uncle was elated with the unexpected delivery, but it was his words that touched him the most. "Wah... so many [sic] good food ah, I dont dare to buy this expensive food," the uncle said, which definitely triggers something in us, as it did Mamat. Mamat added in his post that "looking at him happily eating" just "made my day". Commenters were quick to praise Mamat for his kind deed. However, some warned that it would have been best to keep such gestures to himself, as GrabFood management may have issues with instructions not being followed. That concern can be safely dispelled, however. 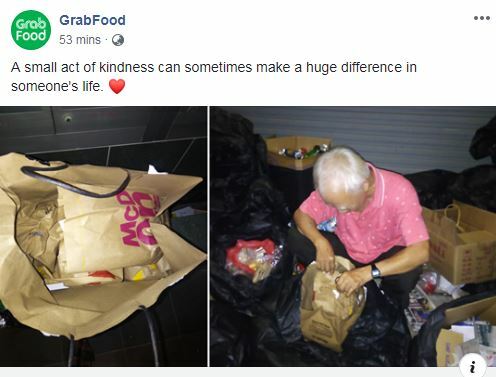 In a deft PR move, GrabFood posted Mamat's story on its Facebook feed on today (March 18), stating: "A small act of kindness can sometimes make a huge difference in someone's life." And just as kindness goes a long way, the story's also a good reminder that the little things we take for granted in life may actually mean a lot to others.